versions look like anachronisms among their contemporaries. Between the zig-zag envelope and the triangluar basket, it doesn't take a highly trained eye to spot a Barnes. 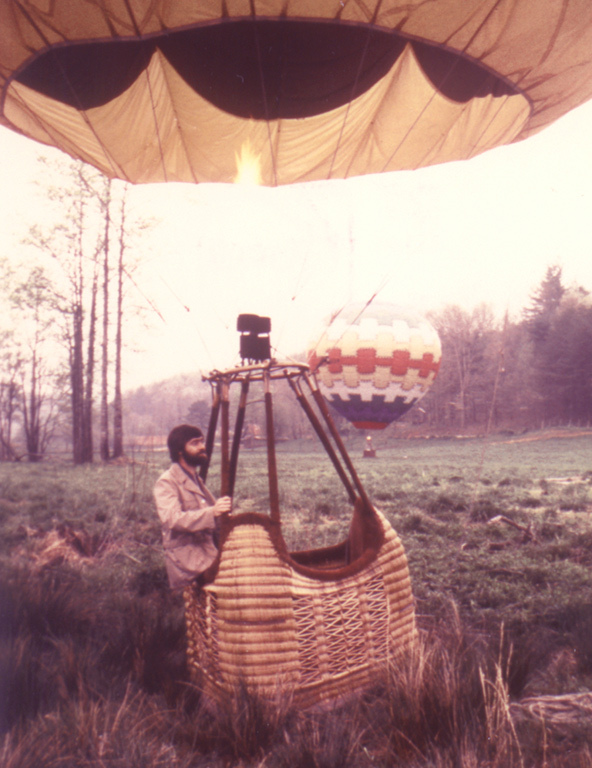 When Tracy Barnes set out to design hot-air balloon in the late '60s, he employed a clean-slate approach, loath to ape what "the other guys" were building. This resulted in the distinctive zig-zag envelope (which results in less fabric waste), and the use of high-gloss, high-heat-resistant polyester instead of the more-common nylon for envelopes. 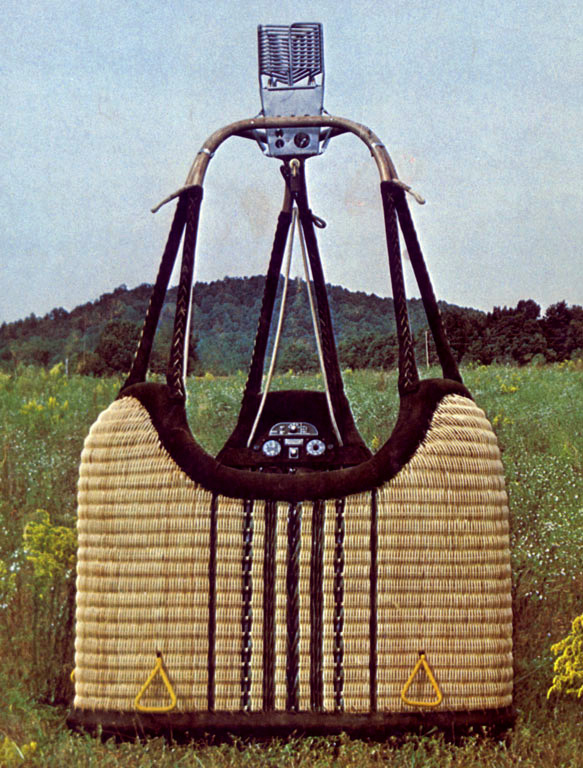 Barnes designed an instantly-recognizable triangular basket, which efficiently apportions space, and resists tipping, but which he is said to have conceived because three tanks held just the right amount of fuel. Possibly most important, Barnes drastically simplified venting and deflation by inventing what, today, sounds obvious: the parachute rip. 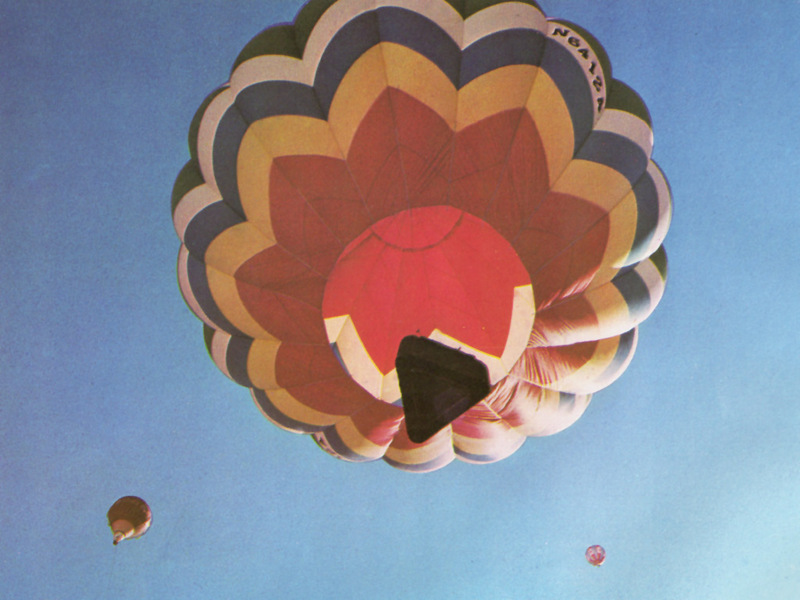 (Another innovation, although falling just after the years on which this site focuses, was the FlexNet® Envelope, which nearly obliterated the possibility of envelope tears growing to disastrous proportions.) 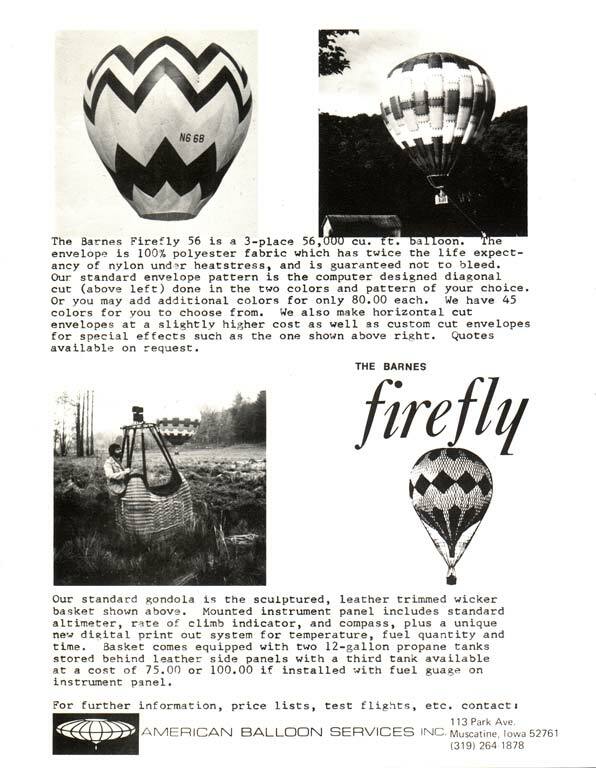 The type certificates issued to the Balloon Works (the company was never officially called "Barnes," though most of the ballooning public used the moniker) are still the basis of the popular line of balloons purveyed by FireFly Balloons, the company's name from 2000 on. 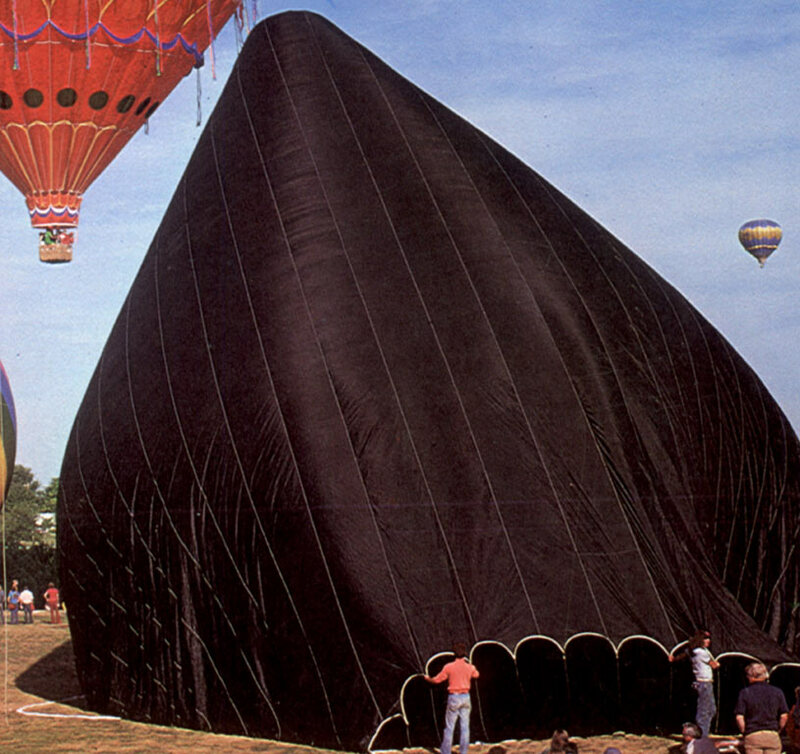 Tracy Barnes got out of the manned balloon business years ago, but continues to invent and innovate, designing unmanned advertising blimps and balloons at The Blimp Works. 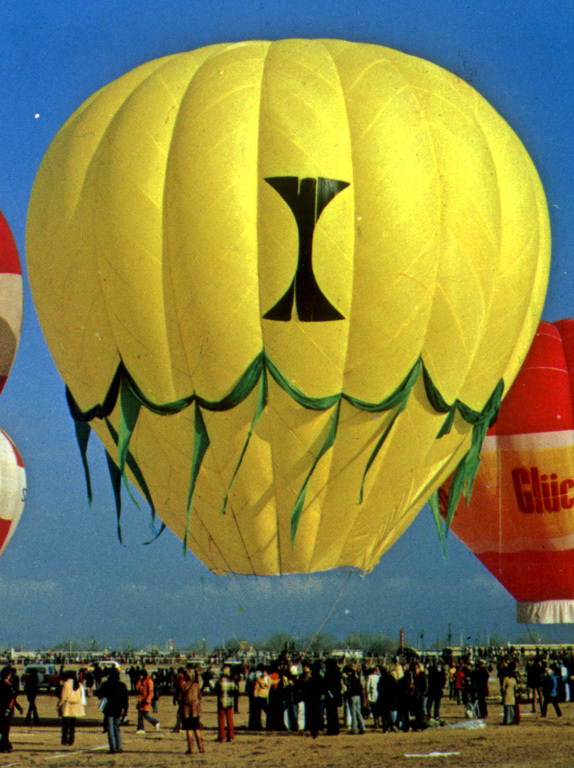 If you have anything to help me document the formative years of these groundbreaking balloons, be it photos, product literature or just facts, please drop me a line. E-mailed images are welcome (write for an email address), or I'm happy to scan mailed materials, and return them at my expense. I hope it's not long before this page becomes a tribute truly worthy of Tracy Barnes' many innovations. 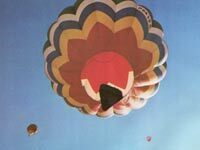 Tracy Barnes took first place at the inaugural St. Paul Winter Carnival race (essentially the first American competition of the modern hot-air era), beating such lighter-than-air heavyweights as Ed Yost and Don Piccard. 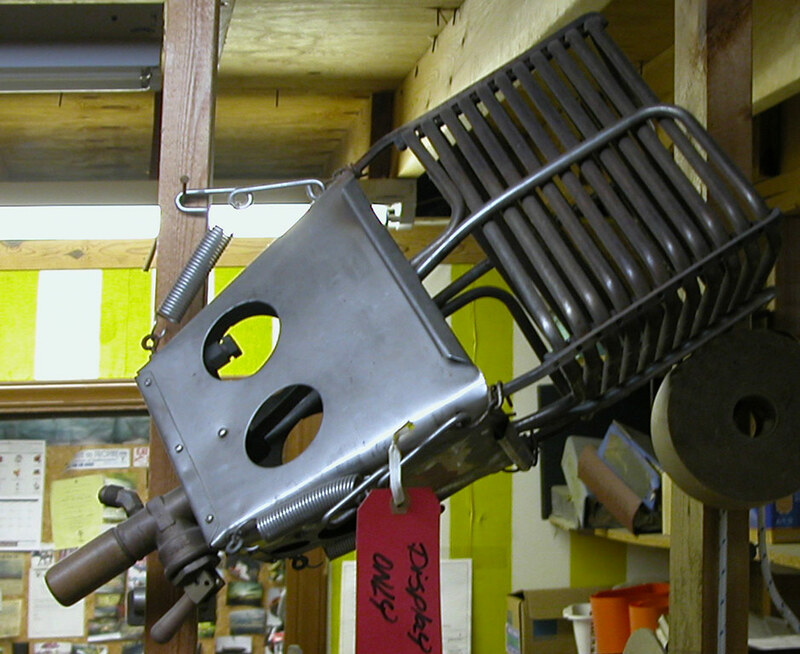 One of the "experimental" Barnes models pre-1974 type certification (you know it's an early model if the basket's a rectangle). 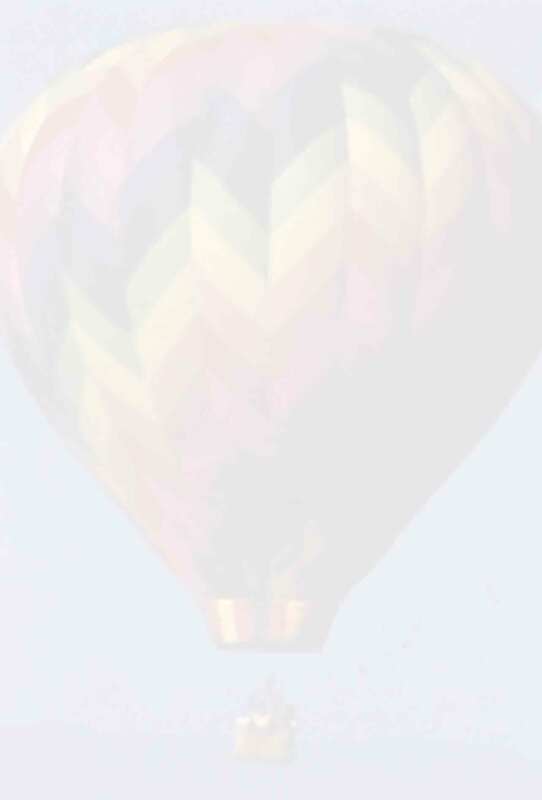 Here's another shot, in profile, of the same balloon. 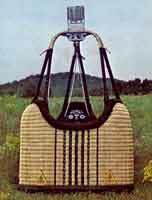 The earliest Barnes baskets were quite similar to later models, but for the load ring and the much different burner (anyone got a clearer shot of those?). Yes, that's Tracy in the basket. Barnes lost little time moving beyond the standard zig-zag pattern - this patchwork effect showed off the envelope's design flexibility as early as 1972. 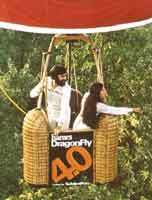 Tom Oerman made up this ad in 1972, shortly after completing his first commercial ballooning contract. "I figured if I sold one," he says today, "I'd be a dealer." 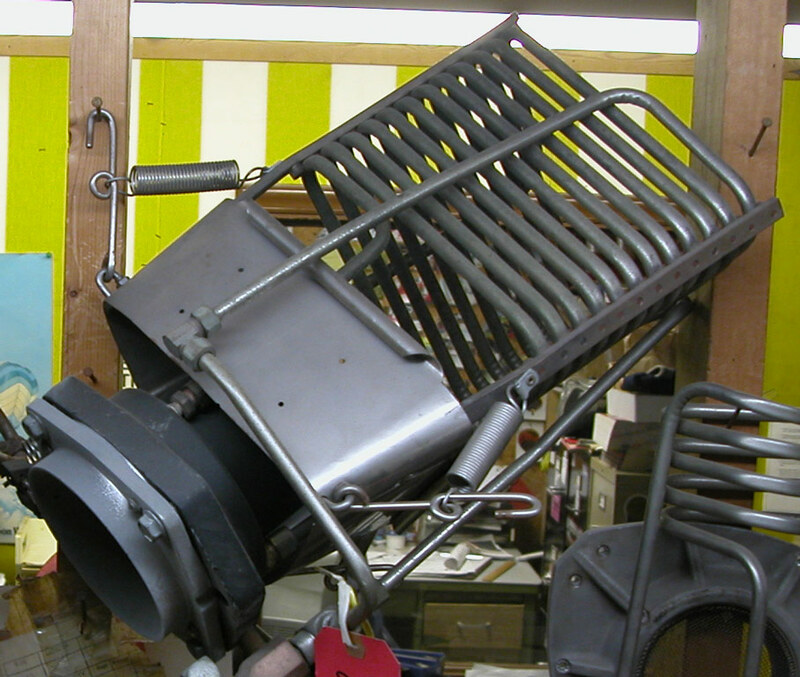 The well-known Barnes triangular basket (and, of course, triangular burner), this one from 1978. Mid-'70s Barnes instruments, neatly integrated into the opulent basket (sloppily colorized by the author). 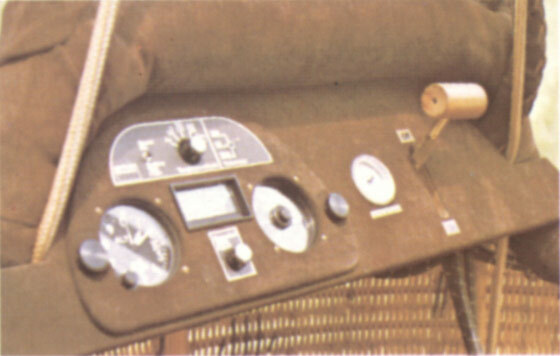 With bigger baskets came bigger control panels, complete with appointments like remote blast valves (from a Barnes sales brochure, circa 1978, contributed by Tom Oerman). Tracy Barnes built this solar balloon, which first flew on May 16, 1973 (later flown, wisely, with a backup burner). Apologies for indicating the wrong date above (by two years), an error left uncorrected for far too long. 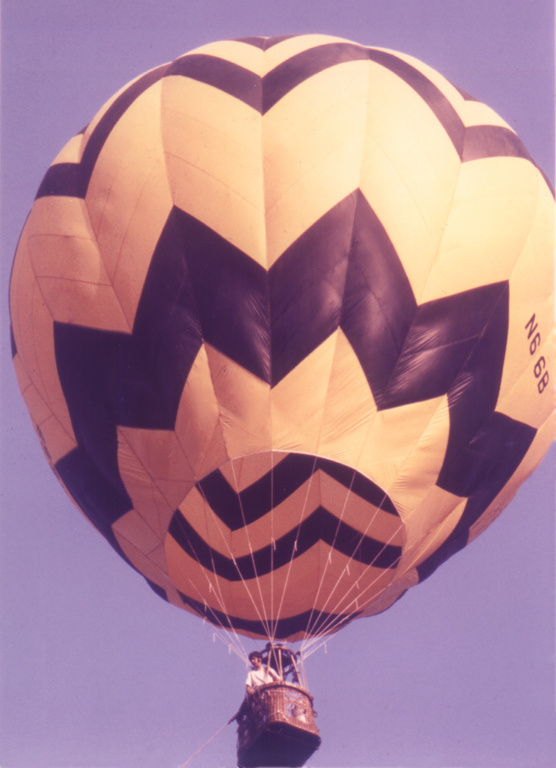 During the mid-'70s, a market began to develop for low-cost balloons, like Semco's base models and the Raven Rally. Barnes' entry was the DragonFly - spartan by Barnes standards, but still a class leader in its appointments. 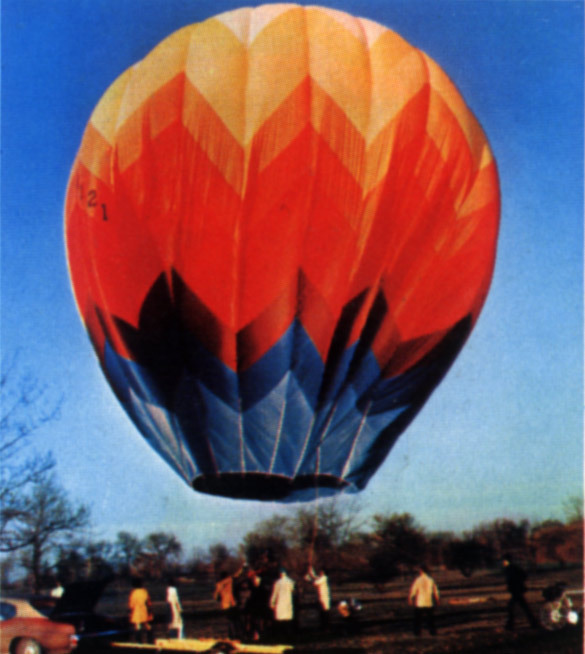 This Barnes flew at the 1973 Worlds, as did this one (with the competition's only female pilot), and this one, mentioned in Tom Oerman's recollections below. The photo above is also, incidentally, the only shot I've seen of homebuilt "Hail Atlantis" (not a Barnes, just a favorite) actually in the air (lower left). 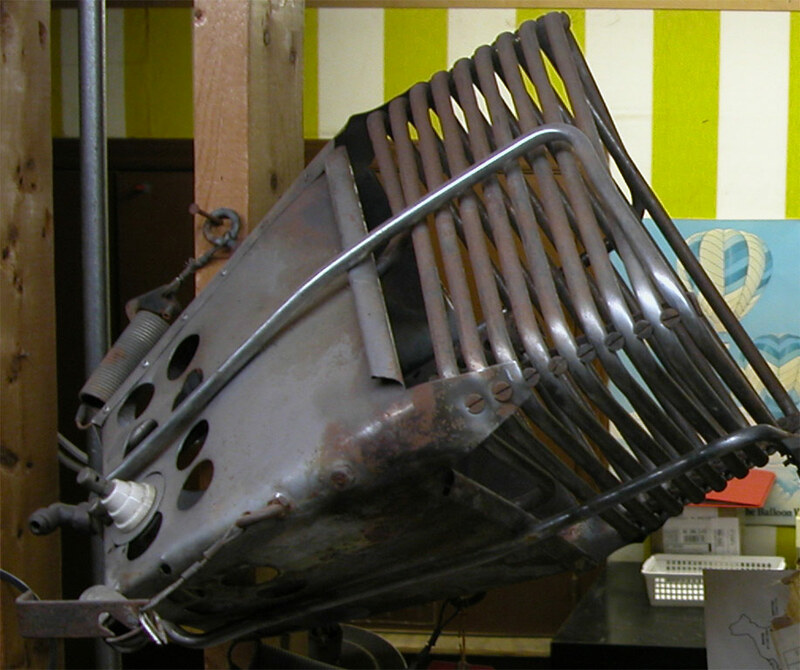 The company has kept some prototype burners around at the Statesville, N.C. headquarters. 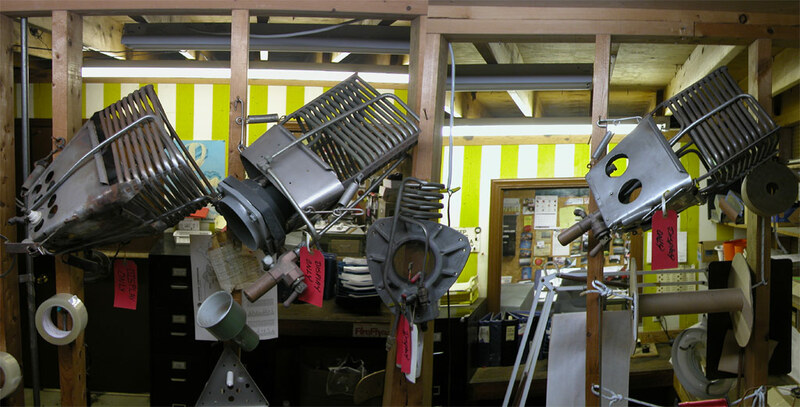 Here is a closeup of the one on the left, Here's the one in the center (which Jon is pretty sure is an early Mirage prototype), and here is the one on the right (all photos courtesy Jon Radowski). 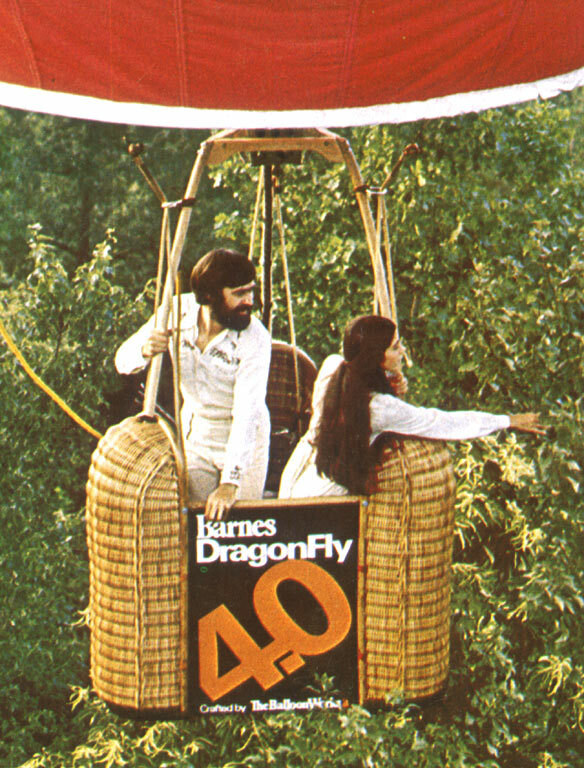 Barnes introduced the low-cost "Stormer" (get it?) 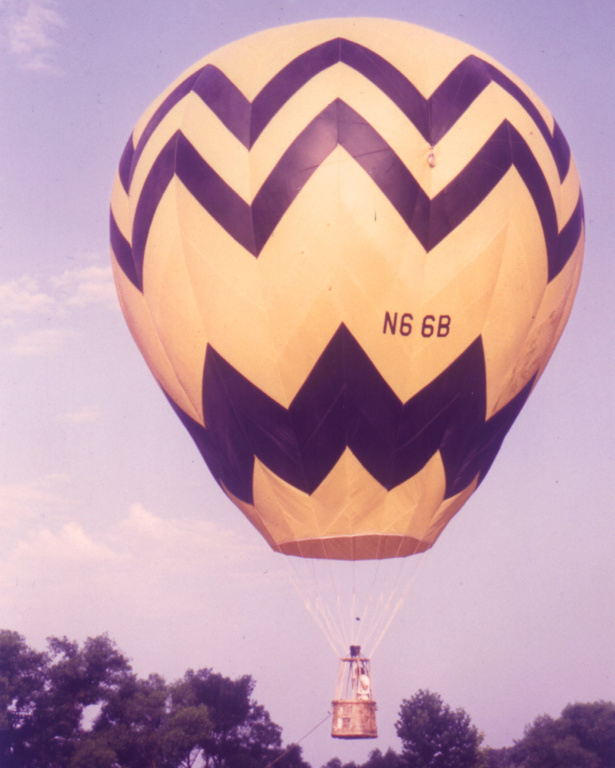 in '80, identifiable, in part, by the short, square skirt and the steep angles of its zig-zag pattern (that's Tracy himself conversing with the basket's occupant). From the early 1970s, Barnes advertised consistently in Ballooning magazine, owning the back cover for a decade, and often running multi-page fold-out ads inside. 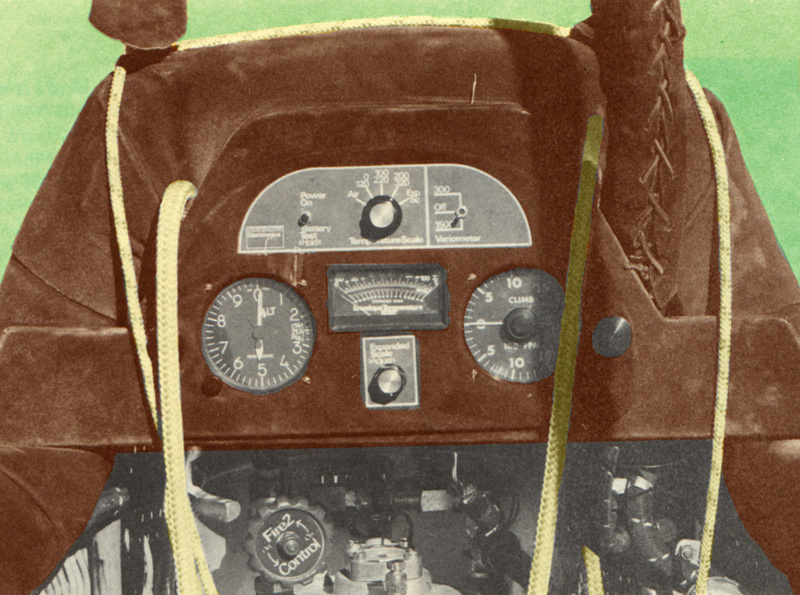 Early ads were similar to other manufacturers' - pictures of product, often festooned with attractive models - but it wasn't long before the ads took on a unique character. Featuring crisp technical drawings and a clean graphic style, the enduring campaign's instantly identifiable look is as up-to-date today as it was in the beginning. With the assistance of Jon Radowski, TEYoSB presents a sampling of Barnes' remarkable print ad campaign. 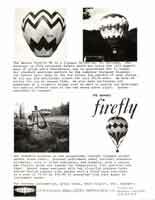 "...As a designer, I was impressed with what Tracy Barnes was doing with his triangular baskets and diagonal cut envelopes (I finished 2nd in the '71 Nationals, which qualified me for the 7-Up Invitational in Columbus, Ohio on September 1 and 2, 1972; and Tucker Comstock had pics of Tracy's balloons). When I finished training Al Desmond of Aurora. Illinois, I suggested we go see what Tracy had to offer. We flew down to Statesville, where Tracy was still operating out of the chicken coops, and I sold Al the first Barnes that Tracy built for someone other than himself. 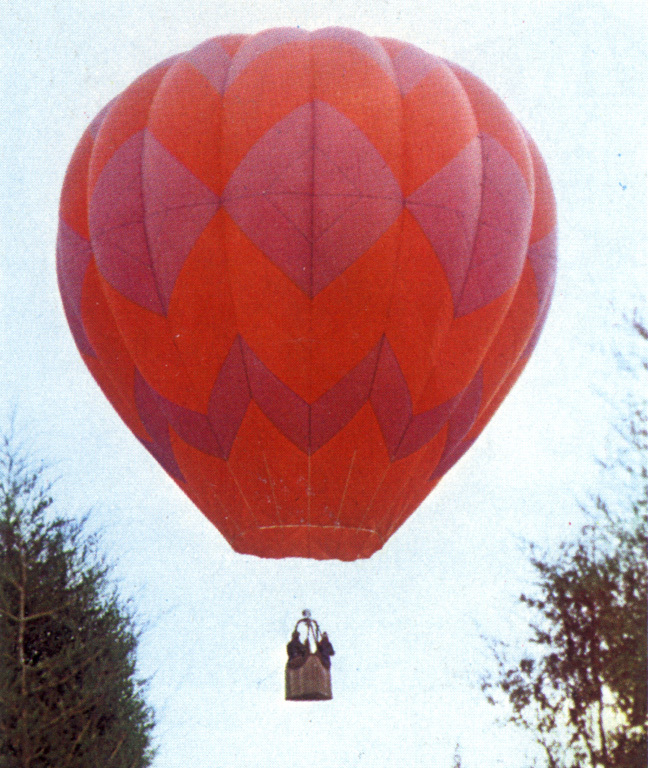 Al named the balloon Little Joe after his wife and it was a beautiful balloon. The design was chosen from about thirty colored pattern sheets on the floor of the Balloon Works when Al, his partner and I went to Statesville. I said: "Al, look at this one. It's the most beautiful!" and he agreed. 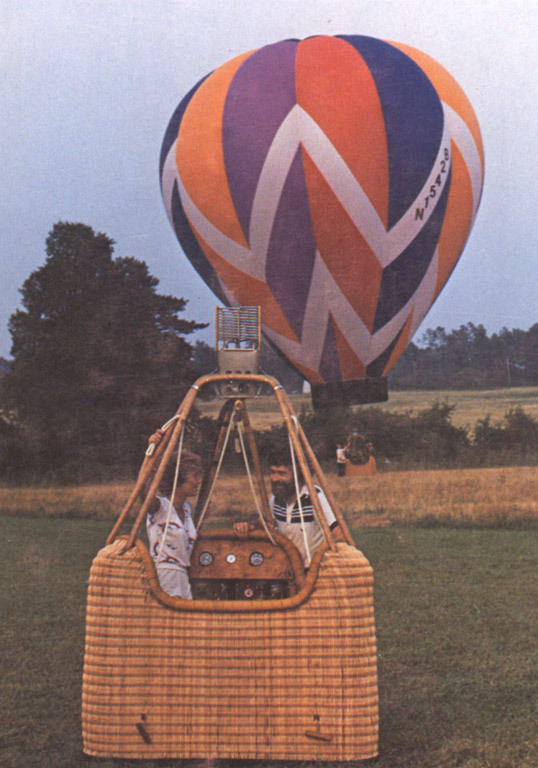 Al really was a test pilot for Tracy; there were so many little things wrong with the balloon! Basically, it was a well thought out design, which is why I wanted to represent the company." 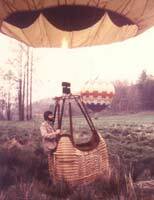 I'm deeply indebted to Tom Oerman for the contribution of a great many pieces of ballooning memorabilia, from which I've taken several images on the site (including five of the images on this page). 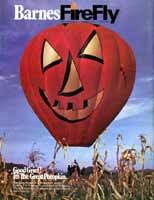 Very special thanks to Mike Emich, for the use of his amazing collection of photos and brochures from throughout the '70s, to Jon Radowski for several ads from Ballooning (Barnes and otherwise), Lance Terry, for the loan of his '78-'81 Ballooning magazines, and to Glen Moyer, for the generous permission to reproduce images from Ballooning. 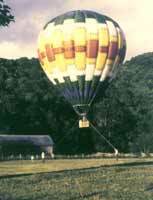 Thanks, also, to Tracy Barnes' younger sister Lynn, for information and encouragement, and a link to this page on the website of Mr. Barnes' current venture, The Blimp Works.